Coins are a powerful tool used to communicate strong messages through varied symbolism. In addition to portraits of influential people and meaningful phrases such as "E Pluribus Unum," animals have often played a prominent role in currency design in the United States and around the world. While American coinage favors our national symbol, the bald eagle, other countries have immortalized different animals of cultural significance on their currency. 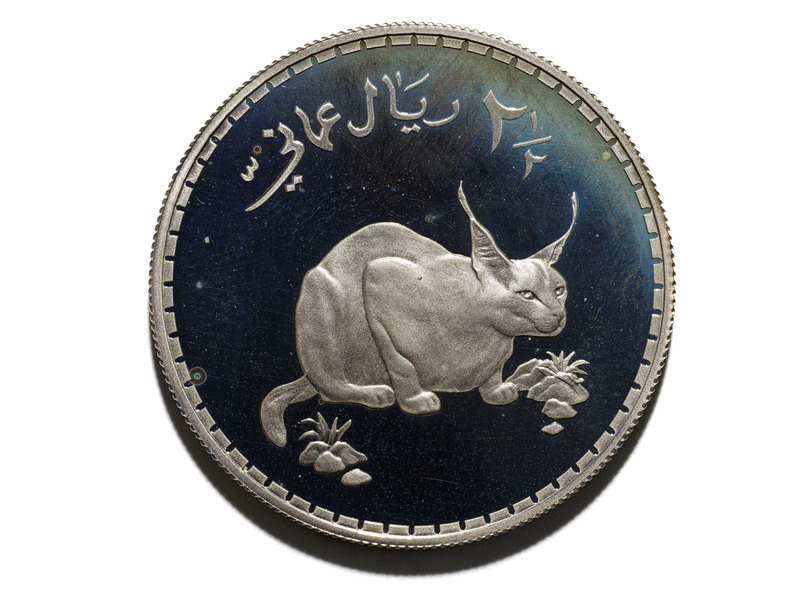 In honor of International Cat Day (often celebrated on August 8), the National Numismatic Collection welcomed the Museum’s mountmaker and cat aficionado, Laura McClure, into the collection to visit with some of our favorite feline coins and notes. The following list contains some of our favorites. 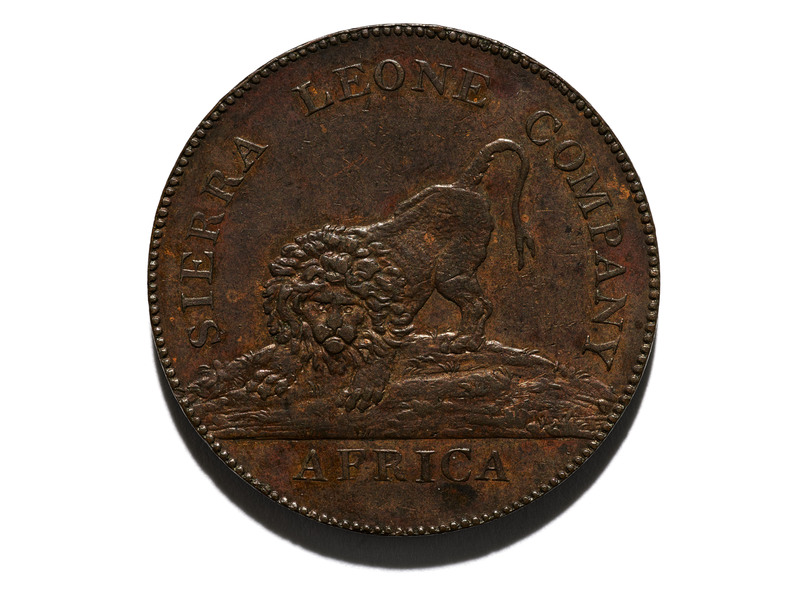 This penny was minted in 1791 by the Sierra Leone Company. The Sierra Leone Company was the corporate entity involved in founding the second British colony on the African continent, in modern-day Sierra Leone. The colony was formally founded in 1792, but the company produced currency prior to this for use in economic transactions. "Sierra Leone" is Portuguese for "Lion Mountain." The West African lion, or "Senegal lion," is genetically distinct from other species of lion. Their numbers are critically threatened by loss of habitat and poaching. Conservation interventions to save these populations are now urgently required. According to conservation biologist Thomas Lovejoy of George Mason University in Fairfax, Virginia, they are referred to as living dead because their population is so small that their extinction is inevitable. According to International Union for Conservation of Nature’s Red List of Threatened Species, populations of the West African lion are very small (around 400 in the wild and no captive population) and fragmented. 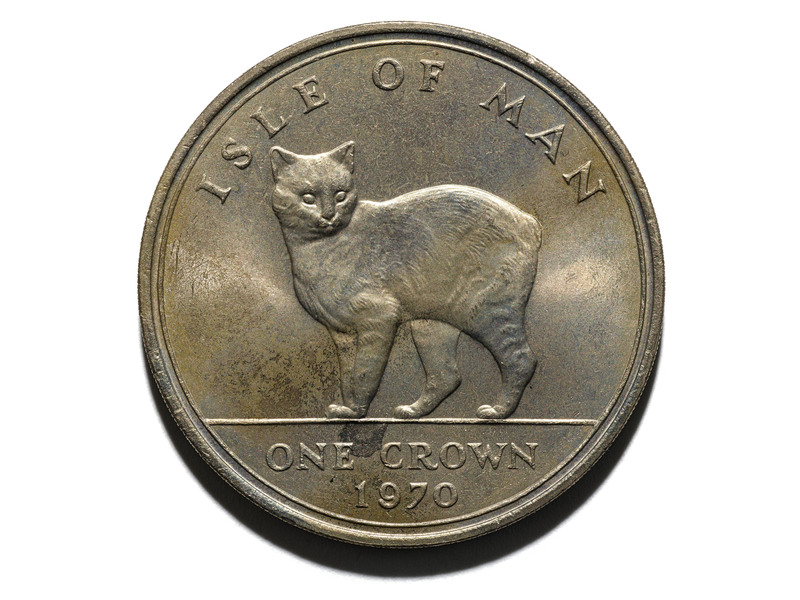 This 1 crown coin from 1970 features a Manx Felis catus known locally as "stubbing cat." The Manx cat is the national symbol of the Isle of Man and as such was featured on the reverse of a series of commemorative coins issued by the Bank of England. This is the first issued coin in the series. The animals’ taillessness comes from a spontaneous mutation that became the norm because they reside on an island in a closed environment. Since cats use their tails for balance when running, jumping, being catty, and to communicate body language, it seems odd that some should lack them. The tailless gene likely has been passed on mainly through selective breeding by humans, a process called novelty selection. Tail sizes range from zero tail or a bump to a short tail or a half-sized tail. Manx are socially gregarious, great mousers, are often said to be "dog-like" both in their loyalty to their families and their love of play. The people of Isle of Man are so cool, they have made the Manx their national symbol. People of excellent drawing ability, such as J. Alden Weir, illustrate the Manx. A particularly beautiful coin from Oman is the 2 1/2 rial from 1977, which features on the reverse a caracal lynx, Caracal caracal schmitzi, also referred to as the desert lynx or Arabian caracal. Interestingly, the previous denomination in Oman, rial Saidi, was changed in 1970 to rial Omani to signal the regime change after Sultan Qaboos deposed his father. Caracals belong to the caracal lineage and are therefore closely related to the serval and African golden cat, instead of being a true lynx. They are known for their long black ear tufts, great hunting ability, and affection for soccer. They have been known to jump into the air and swat down six birds with a mighty swipe. Because of their jumpiness, they were once captured and trained to hunt in India and Iran. They are the smallest of Africa’s large cats and also the most formidable. The caracal isn’t afraid to kill prey bigger than itself, like a springbok or a young kudu. According to the International Union for Conservation of Nature (IUCN), habitat loss and human disturbance/hunting are the main threats to their populations. For more information about the caracal check out: "Smithsonian Zoogoer" At the Zoo: Caracals, A Black-Eared Mystery. 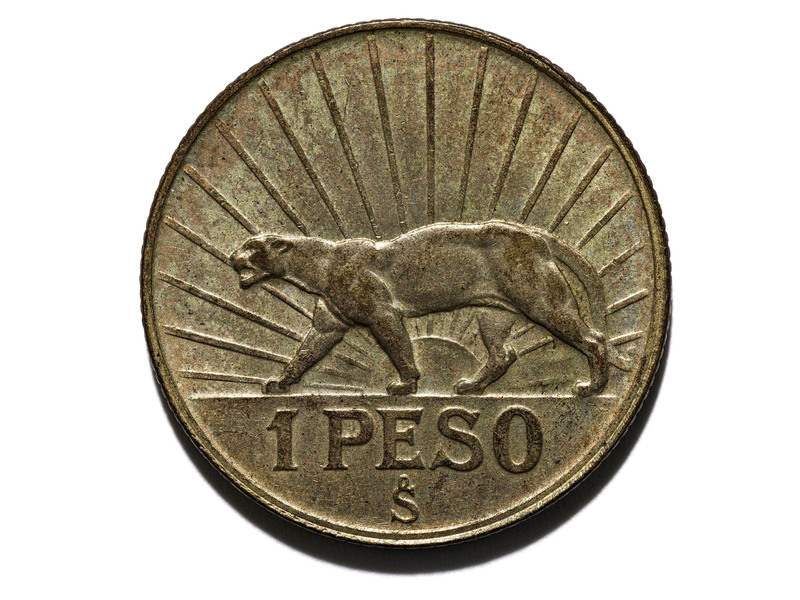 A 1 peso coin, minted in 1942, contains a fearsome image, a cougar, puma, or mountain lion, Puma concolor. In 1942 Uruguay had just begun to rise from economic crisis, ratifying its fourth constitution, so it is no surprise that the designers of the peso coin would call upon this fearsome cat to symbolize their new government. Interestingly, there are 40 different names of this species, such as mountain lion, puma (Incan), panther, Shadow Cat, Lord of the Forest (Cherokee), Cat of God (Chickasaws), and Super-Awesome-Wonder-Cat (McClure). In Uruguay they are known as "león bayo" and are super adaptable; found in most American habitats, they are the largest of the small cats. These cats resemble domesticated house cats, but are the size of a human. According to the San Diego Zoo, though they make sounds similar to a house cat (hissing, growls, purrs, chirps), they do not roar. As an ambush predator, they will hunt anything from insects to things with hooves. Female cougars raise the cubs and are fiercely protective. They are good climbers (enjoy tree houses), and are able to swim (except feel uncomfortable in swimsuits). This Nepalese banknote worth 500 rupees (issued in 2012) features Himalayan Bengal tigers on the reverse. This note is part of a revised banknote series issued in 2012 that includes inscription in English as well as the date of issue printed in the reverse of the note. Tigers are the largest members of the cat family and are known for their power, strength, and awesomeness. Bengal tigers, Panthera tigris tigris, generally weigh between 240–500 pounds, but can grow up to 700 pounds. Since they are so big, they do what they want and what they want is be left alone to hunt in an ambushy way. A favorite type of attack for these tigers is from the side or behind by grabbing the prey’s throat and killing it, then dragging it into cover to chill and eat up to 60 pounds of meat. According to the article The Secret Of A Tiger’s Roar from the American Institute of Physics, a tiger’s roar is "infrasound" or a lower frequency than what humans can hear. The sound can travel through buildings, forests, and even mountains. If you’re standing next to a roaring tiger, you’re literally going to feel it. Unfortunately, humans have been hunting them almost to extinction for many reasons; maybe one is because of their powerful singing voices. Maybe you can hear a Sumatran tiger at the National Zoo! Hillery York is collections manager for the National Numismatic Collection. Laura McClure is mountmakerand a dedicated cat aficionado. They recommend A History of Cats from 1858 to 1922, a new book collection, blog series, and online exhibition from the Biodiversity Heritage Library.